For several months I've been warning of the topping process that was completing in the major European financial markets/bourses. While I do not expect a crash at this stage of the game, as their respective momentum indicator lines have just crossed down over their respective UTLs, but at some point, the realization will hit that all of Europe is in a bear market, and they will exit their respective markets, and the "hot" money will find its way into the US markets and mark the acceleration phase in our final topping process. 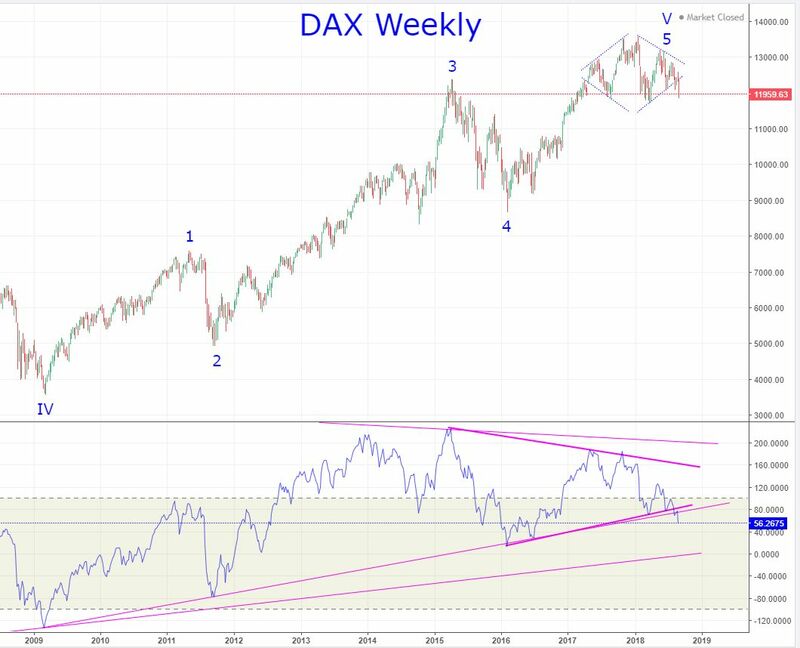 Below is the DAX and CAC40 weekly charts showing they've clearly fallen out of and closed out of their diamond formation AND below their UTLs on the momentum indicator line. Of the major European financial markets/bourses, France's was clearly the weakest - I think mainly due to their socialist leanings. 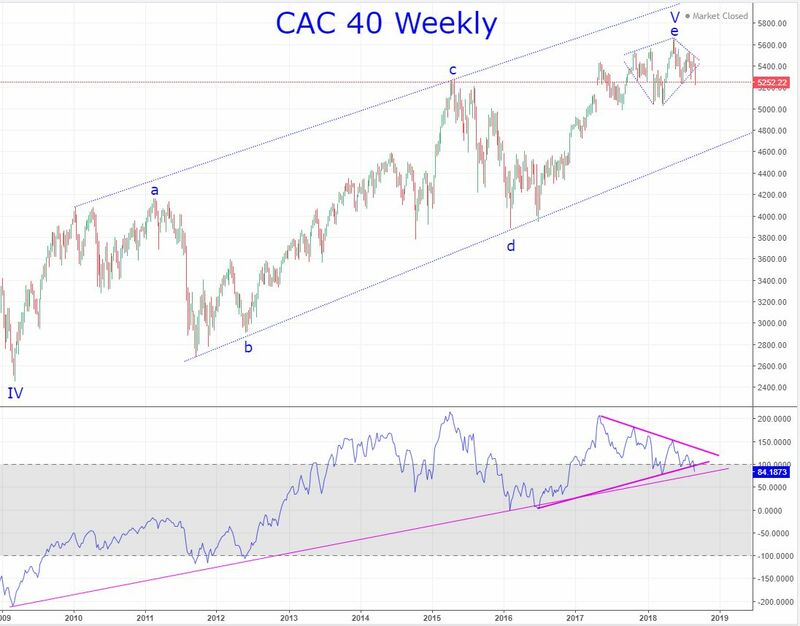 Since the Wave-III high in 2000, the CAC 40 has been unable to push upward to new ATHs, and in fact the rise over the last nine years has been a huge ending diagonal triangle, culminating with a diamond formation, which it clearly fell out of on a closing basis this week. Factors that are pressuring Europe as a whole include the refuge crises, socialist policies, the Turkish debt crises, bad EU policy - political and economic, and the new bull market in the US dollar... and none of these factors appear to be changing any time soon. Edited by tsharp, 09 September 2018 - 11:22 AM. 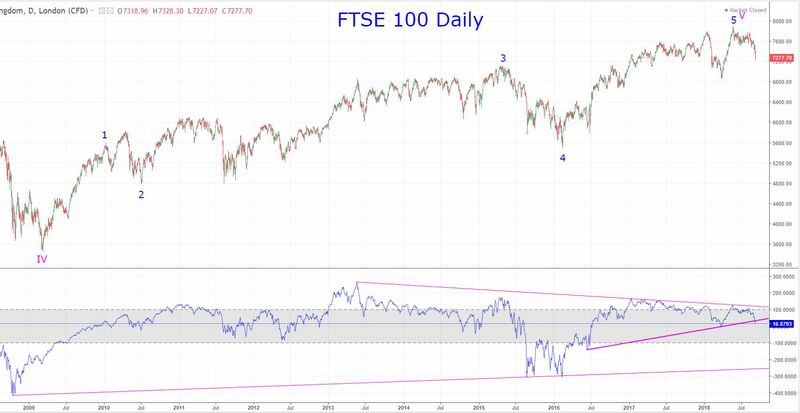 And last, but certainly not least, the FTSE 100 also joined the ranks of bear market kick-off on Friday's daily close... interesting to note how the momentum indicator line was essentially riding the 100 line for most of the rise off the 2016 wave-iv lows - not a sign of strength at all. Edited by tsharp, 09 September 2018 - 11:37 AM.